El Pasajero has left the station! 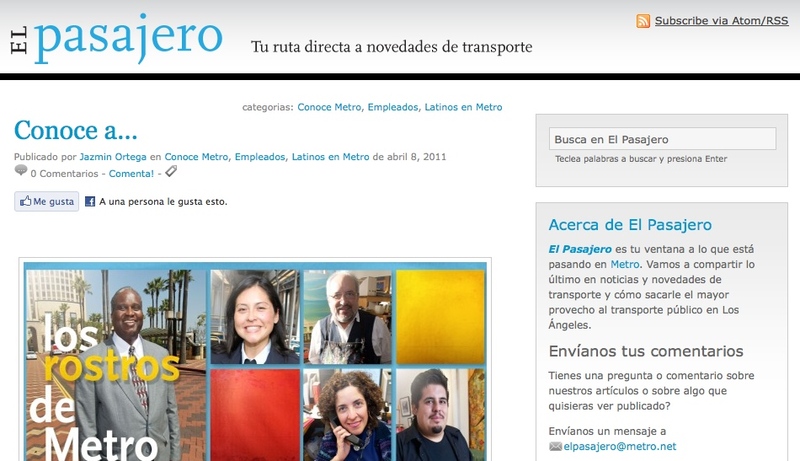 Metro’s new Spanish-language blog, El Pasajero, went live this morning. It’s the first Spanish-language blog by a transit agency in the United States. As I wrote the other day when posting the news release about the new blog, The Source and El Pasajero will be sharing some content and I think this is a great addition to Metro’s public outreach efforts. We are always moving, from home to work, to school, shopping and sightseeing. We are all passengers. If you’re reading this, it’s likely you use Metro and that one way or another have contact with our agency. Today we are launching El Pasajero. It is for those who are a passenger on the bus, train or car cruising along the highways of our region. First let me introduce myself: I’m Jazmin Ortega and for over a decade I have observed and reported on issues affecting the Latino community in Southern California, including transportation, education and politics for the newspaper La Opinión. As press secretary to Mayor Antonio Villaraigosa, I saw firsthand how decisions are made that affect the mobility of every resident of this great region. I’m joined in this project by Maria Luisa Arredondo, a journalist born and educated in Mexico City, with more than two decades of experience covering the Los Angeles area, also for La Opinión. 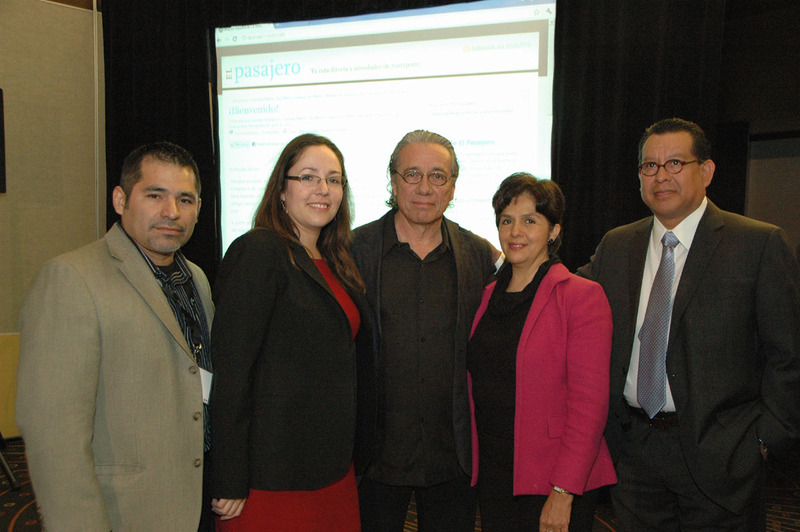 Actor Edward James Olmos (center) joined the El Pasajero crew at the announcement this morning of the new blog. From left: Agustin Duran, Jazmin Ortega, Maria Luisa Arredondo and Jose Ubaldo. Photo by Luis Inzunza/Metro. Your input is invaluable and your contributions are needed on this blog. You’ll find something new everyday. Please follow us and visit often. I see El Pasajero as a way to provide a better view of Metro beyond just the bureaucracy that manages buses. Metro also runs a rail network and oversees road and highway projects funded by Measure R, approved by two-thirds of Los Angeles County voters in 2008. I want this blog to go behind the scenes and statistics to introduce you to those who run Metro — from the bus driver to the executive who manages millions of dollars in transportation projects. Latinos are two-thirds of Metro’s riders and more than a third of those working to improve this agency. We will tell their stories. In this space, we will also update you on how funds are being distributed from Measure R (which is money we pay as sales taxes) to buy more buses, expand rail service and improve highways in Los Angles County. We will also report on future service changes and explain plans to help cyclists, who are increasingly opting for two wheels to get around. Needless to say, Metro is a large and complex agency. And it is very important for those who depend on it each and every day. Metro is also subject to criticisms and complaints. My aim in this space is to share information in an objective manner to better understand the role of Metro in the community and promote a healthy exchange of ideas. El Pasajero intends to be a timely, relevant and interesting discussion of transportation issues. At first glance, how we move from one place to the other may sound boring. Ultimately, however, how we get around is a story about how we live each day in a modern city with millions of lives and stories intertwined. That story begins today at El Pasajero. Please send us your questions, comments, photos and videos of your journeys (although not while behind the wheel! ), And tell us what you would like to read about in this space. Get ready for the trip, and Welcome to The Passenger.